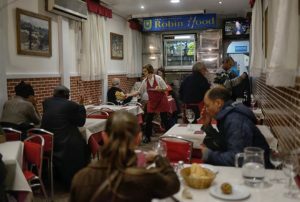 Just finished reading a story in The New York Times about the Robin Hood restaurant chain in Spain run by Father Angel Garcia Rodriquez, who operates a pay-for establishment during breakfast and dinner only to serve the homeless for dinner. The dinner crowd is served by waiters and waitresses, on real plates, using nice cutlery, not plastic. For free. In addition to the charity, his wish is that the experience will engender hope in his nightly diners. This planned act of kindness is popular and successful and may be on its way to Miami, Florida. Acts of kindness and selflessness create powerful feelings for all involved. Selling is not a human trait. Charity is. Every brand should ask itself “What is the nicest thing we have done for customers this year?” If the answer is a one-day-sale or a pre-printed holiday card the brand needs to reexamine its approach. Planned acts of kindness should be requisite for all brands. The financial officers may not always see the value, but they’re not building brands. They are building bank accounts.